Truth be told, I had never made bread before I found this magical recipe on my favorite food blog, Bread and Honey (although original credit belongs to the NY Times). But I did, like many people, have fond memories of my mother doing so. 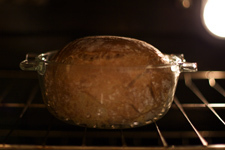 And that smell of baking bread, mouthwatering slow in our old oven, is still one of the most comforting I know. Unfortunately, that comfort seemed to come at a price – a whole lot of elbow grease, a whole lot of time. But now, with just a little planning and foresight, fresh baked bread is as easy as, well, this is a whole lot easier than pie! optional: I have thrown in a handful of rosemary, I have tossed in sunflower, poppy, and sesame seeds, I have sprinkled in Italian herbs, and I have mixed in kalamata olives. The possibilities are endless; customize to taste! In a large bowl, combine all ingredients until thoroughly mixed. Dough should be shaggy. Shaggy is a *really* great way of describing dough. 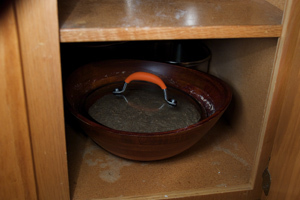 Cover dough with a pot lid or dish towel, and put it in a warm place to rest. I usually hide mine in a cupboard. Let the dough hang out for a good 12-20 hours. Yep, 12-20 hours. The next day, check your dough. It’s ready when the surface shows tiny bubbles. Spread some flour on a cutting board or counter, and turn the dough out onto the surface. 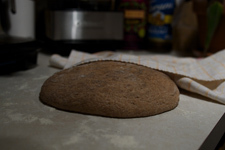 With floured hands, fold the dough over onto itself (like a dough taco), and then fold it again (double dough taco?). Let it rest there for about 15 minutes, and then cover it with a cotton dishtowel (non-terry cloth). Let it rise under the towel for about 2 hours. 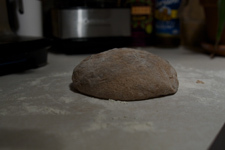 The dough is done when it has doubled in size, and no longer springs back when depressed. 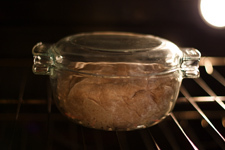 A half hour or so before the dough is done rising, preheat the oven to 450º. 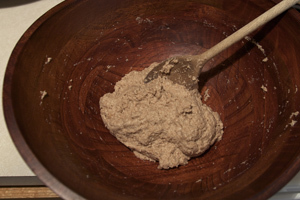 With floured hands, transfer the dough to a lightly sprayed or floured cast iron, enamel, Pyrex, or ceramic pot – one that has a tight-fitting lid. (Warning: DO NOT use teflon-coated or glass bakeware. Teflon cannot stand this heat, and will make stinky smoky awefulness. The first time I made this recipe I used a glass dish. As I was leaning over to sniff my bread straight out of the oven, the glass dish literally shattered in my face, because it cooled too quickly sitting on top of the hot oven. Don’t risk it! Use Pyrex.) Cover the pot with the lid and bake for 30 minutes. Remove the lid, and bake another 15-20 minutes, until loaf is well browned. Cool on a wire rack, or eat hot with lots of Earthbalance™, mmmmmmm. I don’t actually have any pictures of a finished loaf, because it never sticks around long enough to to be photographed! But I hope you enjoy, and get as much use out of this recipe as I have. Homemade bread, containing only the simplest and purest ingredients, is truly a heart- and belly-warming treat. Where did you get that dish? It seems like the perfect size. I’m going to attempt this after I locate a proper vessel! @Amber – I think this dish was a hand-me-down from a friend who was moving, and it’s basically Pyrex ‘tupperware’. I really think Pyrex is the best bet for baking. I would just peruse your local thrift stores (Salvation Army and Savers both have great ‘home’ sections) for a similar piece. Any bakeware will do – just make sure it’s got a lid! Sayward – I watched this the other day. Cook’s Illustrated does free podcast videos enjoy! @ Jodiiiii – Oh wow, how cool that they offer free lessons. That’s great! Careful – Pyrex can explode from fast temp changes as well! But it usually only happens with older Pryrex – dishes that have small defects/scratches/etc in them. I look forward to making this bread soon though! It looks delicious! Think I might try some roasted garlic & rosemary. Mmm! @ Sarah Jewel – Thanks for the heads up about the older Pyrex – I didn’t know that! And yum! garlic and rosemary sounds good. The rosemary loaf was my favorite that I’ve made. Let me know how it turns out! Can this work with a sourdough starter? Tried it and yes, it makes a great sourdough. @ Vrimj – Hey, sorry I didn’t get back to you soon enough, but I’m really glad to know the sourdough starter works! If you ever happen back by, how much starter did you use? I just came to your blog because I just tried this recipe baking it in Corningware, I was afraid to preheat the dish and another site I was reading said to put the dough in a cold oven and cold dish. I did that and it rose and baked perfectly but I couldn’t get it out of the corningware!! I sacrificed a good bit of the bottom crust to get it out. It tastes really good so I want to continue. I was searching for a different cooking dish online, but not finding what I really wanted (that I could afford that is) Then I remembered that we inherited a pyrex baking dish that is exactly like the one you have pictured. Yours is the only site that mentions putting oil in the baking dish and from your description it seems you do not pre-heat your pyrex, is that true? I really would like to be successful with this type of bread baking (I have done the old fashioned type and it is so time consuming) I am close, I tried the 5-minute bread recipe with minimal success, this one despite my fail with the bottom crust is nice and crusty with a nice crumb. @ Gabrielle – Oh lawdy, I’ve lost so many loaves to sticky bottoms. It’s such a bummer! That’s why I started oiling the pan. Now I actually give a spritz with the spray oil, and then follow with a dusting of flour. I’ve tried both cold and pre-heated bakeware. I’ve gotten both to work (with the oil) but have had much better success with the pre-heated, so now I pre-heat. I say give it a try – and let me know how it goes! 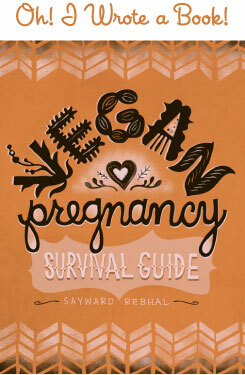 Hi Sayward, thanks so much for the details and advice! I used to bake bread a lot using the Tassajara bread book but it is a lot of work and I love sourdough bread so my plan is to get this recipe to work and then try it with sourdough starter. Thanks again, I will start another batch and try pre-heating the pyrex with the oil and flour. Love your site, love your recipes! Let me know how your sourdough starter works with this recipe. I just inherited one of my own but haven’t began using it yet . . . I will keep you posted on my next experiment, (I haven’t baked anything lately, been so busy) as well as the adventure into the sourdough version! @ Gabrielle – Thanks, please definitely let me know! I know this is a SUPER-old blog post, but hopefully you’ll get/see this comment. Just wondering what’s the size of the glass dish you used? 2 quart, 3 quart, etc? Thanks! @ Jenny – Hey lady! Oh man, I’m really not sure but my best guess would be 2 quart. It’s not huge at all. Thanks for the fantastic site. I love reading about others experiences with this bread.I just discovered the Sullivan no knead bread a few short months ago and we just love it! I have had great success using smaller vessels. I am a thrift store nut as well, and I have a small round castiron, enamelled covered pot and an oval glazed clay baker that I divide a recipe just before the 2 hour rise. They make a perfect size to give away to one person. Today I am using those 2 as well as a 2qt corning ware and a stainless steel dutch oven(my usual choice for a single large loaf). I was experimenting with the flour this time. The 2 smallest loaves will have 2cp white and i/2 cp each of rye and whole wheat. The other 2 have 4cps white and 2 cps multigrain. I added a bit more water to accomodate the more absorbant flours. Just a sprinkle really. Anyway, I have found it always turns out great and never sticks when they are preheated. I have never tried it the cold oven way. so many thanks for this blog. i found it 2 days ago & am totally obsessed! i have made very similar breads to this one, and was wondering if you have ever made sprouted breads? i saw your post on soaking and the note on baking. i love ezekiel breads but we just can’t afford to buy it on a regular basis =( do you have any experience making your own sprouty loaves? i wonder if you were to soak the flower in part of the water and then dissolve the yeast in the remaining water & add it to the soaked grain? thanks so much! @ sara thomas – I haven’t experimented with sprouted breads because I’ve sort of been off wheat for a while now. But my husband is a bread head, so I really should get back into it! Maybe next fall . . . Anyway, for sprouted breads my understanding is that you buy the whole grain (wheat berries) and then soak and sprout them, then grind them yourself into flour, and then use that to make the bread. You can also soak store bought flour, which will have some of the same effect. You soak it overnight in water + acid (the traditional way is with buttermilk), you can use alt milk with lemon juice or vinegar for the same effect. Then just proceed in the morning with the rest of the recipe. I really should work out a recipe for this. Okay, it’s on the autumn list! oh yeah, duh! that makes sense about sprouting then grinding! it would be awesome if you were able to find a recipe, i’d love to try making some of this! there are other resources though so no pressure, but i do enjoy your blog the most for sure and would much rather read about it here! =) thank you so much!